Frank H. Evans was born in 1869 in Pittsburgh, Allegheny County, PA, the son of William J. and Eva (McKinney) Evans Sr. When Frank was young, his father was badly injured in an accident. The boy and his younger brothers were admitted on Dec. 13, 1876 to St. Paul Orphanage in Pittsburgh, under the care of Most Holy Father Domenec. He was about age eight at the time, and Bp. Domenic agreed to pay all of the boys' expenses. Frank was brought back home two years later to help his mother care for the disabled father, who died a short time later. In about 1881, when Frank was 12, his mother married George Henry Minerd, and Frank's younger siblings rejoined the family. Frank grew to adulthood in Pittsburgh. While residing at 165 Bidwell Street in Pittsburgh, during Spanish American War, he joined the U.S. Army and was assigned to the 14th Pennsylvania Infantry, Company E. Under the command of Lt. Col. Graham, Company E was stationed at Fort Delaware, DE until about September 1898, when it transferred to Middletown, PA. According to one history, on Oct. 27, 1898, the regiment took part in the Peace Jubilee Celebration in Philadelphia. Then in November 1898, the unit relocated to Summerville, SC, where it stayed for the duration of the war. The 14th Pennsylvania soldiers mustered out of the army on Feb. 28, 1899. Several years after the war's end, in 1905, Frank began receiving a military pension as compensation for his services. [App. #1341.574 - Cert. #A-8-31-26]. Frank wedded Anna M. McNiff (Dec. 18, 1880-1938), an immigrant from Ireland and the daughter of Myles and Mary (Coyle) McNiff. She was 11 years younger than her spouse. The couple is believed to have borne three children -- Marie Pleasant, William J. Evans and Evelyn Snyder. Frank learned the trade of painting and earned a living in and around Pittsburgh as a master painter. When the federal censuses were taken in 1910-1920, the family resided on Minnesota Street in Pittsburgh. His work in 1910 specialized in carriage painting. In the mid-1920s, he was employed by Pittsburgh Railways Company. Frank and Anna were members of the Veteran Association of his old unit, Company E of the 14th Pennsylvania Volunteer Infantry. They and the children are known to have attended a meeting of the group at the home of Alfred H. Manheimer in the city's East End in September 1925. In early 1926, the Evans were horrified to learn that Frank had contracted colon cancer. He suffered for a little more than eight months, but nothing could be done. He died at the age of 56 on Oct. 23, 1926. Burial was in Calvary Cemetery in Pittsburgh. Anna survived her husband by a dozen years, making her home on Kennebec Street and at 1383 Island Avenue. She immediately applied for and began receiving her late husband's military pension, which would have provided a steady income for her each month in payments. [App. #1561.519 - Cert. #A-5-26-27]. She went to Harrisburg, PA to visit her daughter Marie Pleasant, returning in late November 1938. Just a week later, however, stricken with a fluid buildup in her lungs, she died on Dec. 5, 1938, just a few weeks before her 55th birthday. A high mass was celebrated at St. Rosalie's Church, and an obituary was printed in the Pittsburgh Press. Daughter Marie Evans (1907-1951) was born on Feb. 8, 1907. She married Marshall Thomas Pleasant Sr. ( ? -1969). They were the parents of three children -- Mary Ann Meder, Dolores Walczak and Marshall Thomas Pleasant Jr. In the late 1930s, they dwelled in Paxtonia near Harrisburg, Dauphin County, PA. Circa 1935, they resided in Hagerstown, Washington County, MD. By 1940, they had returned to Pittsburgh and lived next door to Marie's brother William J. Evans in McKees Rocks, Stowe Township. Marshall was employed in 1940 as a vulcanizer in a steel mill, quite possibly Pressed Steel Car Works. In the early 1950s, their address was 3223 Parkview Avenue. Suffering from diabetes and a deadly infection of peritonitis, which spread throughout her body, Marie was admitted to Magee Womens Hospital, where she died on Nov. 7, 1951, at the age of 44. A death notice in the Pittsburgh Press said that a high mass of requiem was sung at St. Paul's Cathedral Chapel on Parkview Avenue. Interment was in Calvary Cemetery. Marshall married again to Agnes M. Kearns ( ? - ? ). They lived at 320 McKee Place in Pittsburgh. On Sept. 27, 1969, Marshall passed into eternity. Requiem high mass was sung at St. Regis Church. Daughter Mary Ann Pleasant ( ? -1978) was born in (?). She married Albert John Meder (July 21, 1933-2012). He was a veteran of the U.S. Army. Their children were Marsha Jaworski, Dana Meder and Albert K. Meder. In the late 1970s, Mary Ann made her residence at 371 Dale Road in Bethel Park. Albert owned two windows covering businesses over the span of four decades, Meder Drapery and Cover My Windows Inc. They enjoyed sailing on Lake Erie. Sadly, Mary Ann died on New Year's Day 1978. A death notice in the Pittsburgh Post-Gazette said that a funeral liturgy was held in St. Thomas More Church. Albert remarried to Shirley Badger and lived in Baldwin and Upper St. Clair near Pittsburgh. They retired to The Villages in Florida in 2007, where they spent the final five years of their lives together. He was a member of the Jazz Club of The Villages and the Three Rivers Clugb. Albert died at the age of 79 on Nov. 5, 2012. An obituary in the Post-Gazette asked that any memorial donations be made to the American Diabetes Association. Granddaughter Marsha Meder married (?) Jaworski. Granddaughter Dana Meder wedded (?) Lesniak. Grandson Albert K. Meder worked with his father in the family business, Cover My Windows Inc. Daughter Dolores "Dee" Pleasant (1937-2002) was born on April 24, 1937. She was married to Walter J. Walczak ( ? -2006). The couple bore two children, Walter "Wally" Walczak and Donna Walczak. She lived in the Oakland section of Pittsburgh. In the 1970s, she is believed to have worked as a custodian in the State Office Building in downtown Pittsburgh. Dolores succumbed on May 28, 2002, in Pittsburgh. A death notice in the Pittsburgh Post-Gazette said that a funeral mass was sung in St. Regis Church. Walter outlived his wife by four years. He died at the age of 75 on Aug. 13, 2006. Funeral mass services were held at St. Regis. 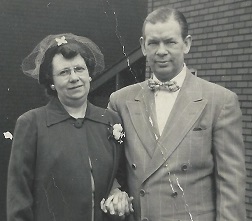 Grandson Walter "Wally" Walczak married Mary Lou (?). They had four children -- Kelly Walczak, Kayle Walczak, Shane Walczak and Melissa Walczak. Son Marshall Thomas "Bucky" Pleasant Jr. (1939-2014) was born on March 31, 1939 at Polyclinic Hospital in or near Harrisburg. News of his birth was published in the Harrisburg Telegraph. He was age 12 when his mother died. Marshall wedded Elizabeth "Betty" Stoyak ( ? - ? ). They were together for 45 years until the separation of death. The couple lived in Oakmont near Pittsburgh and were members of St. Irenaeus Catholic Church. Their children were Reneé M. Pleasant and Randy M. Pleasant. Over the years, Marshall was employed by Northside Foods and was a president of the organization known as OAA. On March 10, 2014, Marshall died at the age of 74. A mass of Christian burial was held in the family church. Son William Joseph Evans (1908-1972) was born on Oct. 28, 1908 in Pittsburgh. William wedded Cloyde Elizabeth Smith (Sept. 11, 1909-1979). The Evanses produced five known children -- Mary Janet Evans, Jean Marie Clark, Carol Ann Burns, Wilma Elizabeth Goin and Mary Frances Mash. Sadly, their firstborn daughter Mary Janet, suffering from convulsions due to unknown causes, died on May 21, 1934 at the age of just 10 months. The child's tender remains were placed into eternal repose in Calvary Cemetery. Circa 1934, they lived at 921 Kennebec Street in Pittsburgh, and then by 1935-1940, their home was at 1383 Island Avenue in McKees Rocks in Stowe Township near Pittsburgh. The federal census of 1940 shows that William's occupation was as a mechanic for an automobile company. Later, the Evanses relocated to Southern California and established a home in Glendale, Los Angeles County. Cloyde is believed to have been active with the Credit Women's Breakfast Club in Los Angeles and was elected vice president in the late 1950s. She also was a member of the Los Angeles Chapter of the American Society of Women Accountants and served as program chairman for the group's meetings in the 1970s. Her name was mentioned in related stories in Los Angeles newspapers. William passed away on March 3, 1972. Cloyde survived as a widow for seven years. She died on May 28, 1979 in Glendale. A funeral mass was held in Holy Family Church, with burial in San Fernando Mission Cemetery. Daughter Jean Marie Evans (1934-2015) was born on Nov. 9, 1934 in Pittsburgh. She was wedded to (?) Clark ( ? - ? ). Jean Marie died in Rowlett, Dallas County, TX on Jan. 9, 2015. Daughter Carol Ann Evans (1936-2016) was born on June 14, 1936 in Pittsburgh. As a youth, she attended the Bellfield Girls School in the city. She married Richard Lawrence Burns ( ? - ? ). The marriage lasted for 61 years until the separation of death. They produced four offspring -- Karen Elizabeth Campus, Constance Ann Foster, Thomas Richard Burns and William Patrick Burns. For many years, the Burnses managed a motel in Morro Bay, CA, retiring in 1989. From there they relocated to Las Vegas and then came to Lancaster, Los Angeles County in 2005. Their address in the mid-2010s was an apartment located at 43945 12th Street West. Stricken with a cerebral hemorrhage, Carol Ann passed away at the age of 80 on Sept. 25, 2016. Interment was in Los Osos Valley Memorial Park. An obituary noted that she was survived by eight grandchildren and a dozen great-grandchildren. Granddaughter Karen Elizabeth Burns married (?) Campus. Her home in 2016 was in Lancaster, CA. Granddaughter Constance Ann Burns wedded (?) Foster. She lived in Eureka, CA in 2016. Grandson Thomas Richard Burns makes his residence in Simi Valley, CA. Grandson William Patrick Burns dwells in Las Vegas. Daughter Wilma Elizabeth Evans (1939-1993) was born on Feb. 9, 1939 in Pittsburgh. She is believed to have wedded (?) Goin. They are believed to have made their home in Burbank, Los Angeles County, CA. At the age of 54, Wilma succumbed in Las Vegas, NV on Sept. 18, 1993. Daughter Mary Francis Evans (1946-2017) -- also known as "Marie" -- was born on Feb. 11, 1946 in Pittsburgh. She is thought to have wedded (?) Mash. She died in Vancouver, WA on May 20, 2017. Daughter Evelyn Evans (1915- ? ) was born in about 1915. She wedded Herbert "Stewart" Snyder ( ? - ? ). 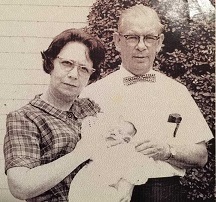 The couple lived in Pittsburgh and were the parents of Donald Snyder Sr. and F. Stewart Snyder. Son Donald Snyder Sr. (1940-2005) was born on Sept. 26, 1940 in Pittsburgh. On July 28, 1962, when he was age 21, he married Regina Louise Boyle ( ? - ? ). Their home was on Dagmar Avenue in Beechview, near Pittsburgh, and their four offspring were Regis Snyder, Donald Snyder Jr., Sharon Palfreyman and Christine Porter. During the early era of the Vietnam War, Donald served in the U.S. Army, 2nd Observatio Battalion, 25th Artillery, and was stationed in Karlsruhe, Germany. He was employed by Equitable Gas for more than 35 years and retired with the position of district crew leader. He also enjoyed automobiles as a hobby. In later years, the Snyders moved to Washington, PA, where their daughter Sharon dwelled. Apparently burdened with heart problems, Donald was stricken and rushed to the emergency room of Washington Hospital, where he died the same day, March 18, 2005. A death notice in the Pittsburgh Post-Gazette noted that his survivors included eight grandchildren. A mass of Christian burial was held in Immaculate Conception Roman Catholic Church, with interment in Queen of Heaven Cemetery. Grandson Regis Snyder lived in Bridgeville in 2005. Grandson Donald Snyder Jr. resided in 2005 in Bridgeville. Granddaughter Sharon Snyder wedded (?) Palfreyman. Her home in the mid-2000s was in Washington, PA.
Granddaughter Christine Snyder was joined in marriage with (?) Porter. Circa 2005, she dwelled in Carnegie, PA. Son F. Stewart Snyder ( ? - ? ) made his home in Moon Township near Pittsburgh in 1981 and in Sewickley, PA in 2005. He and his wife are believed to have produced a daughter Cynthia A. Simone. Mary Ann (Haacke) Haegele has contributed content and images for this biography.